There will be no more Rocky or Rambo movies. Say it ain't so, big guy? The ageing action hero defied a mauling from the critics when his fourth, eponymously titled Rambo instalment debuted in second place in the US charts with a decent haul of a little over $18m (£9.1m). Stallone's comments may come as a surprise to Harvey Weinstein, however, who said on Sunday that he expected the series to continue after the film's auspicious release. The Rambo and Rocky films have grossed hundreds of millions of dollars around the world and are an immensely appealing prospect to the pack of executives like Weinstein that like to surround money-making ventures. Stallone produced, directed and starred in Rambo, in which the famously monosyllabic former Green Beret dons the face paint one more time for a hostage rescue mission in Burma." I saw Rambo last Wednesday and I have to say it wasn't half bad. There was a valid storyline and by the time it really got going I was mesmerized and content. The story wasn't too intricate or involved, it seemed just right for Rambo. All in all, Great job Sly, you should do more Rambo movies. 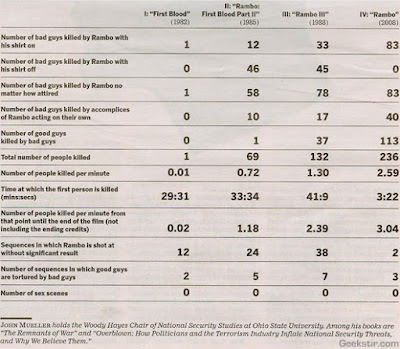 Check out this Rambo Kill Chart below found at Geekstir.